The Power Test Probe is an indispensable toll for the arsenal of any self-respected auto electrician. This electronic tool will help you diagnose and narrow down electrical problems on all modern and old vehicles including cars, trucks, busses, tractors, etc, etc. The Probe also has long enough cable to ensure you can reach the front and back of the vehicle without reconnecting. It is also equipped with two super bright illumination LED's so you'll never work in the dark again.. Check for existence of Positive or Negative Supply to a device. Ensure the Battery Power Clips (3) are connected to the vehicle's battery. Place the Switch (7) in "Measure" mode - middle position marked with '0'. Connect the Test Tip (1) to the point of interest. Make sure the Test Tip makes good connection with the wire or device pin or terminal you are testing for voltage presence. Observe the voltage polarity as indicated by the dual color Polarity LED (6). Red = positive voltage supply is present at this test point with respect to negative terminal of the vehicle's battery. Green = negative voltage supply is present at this test point with respect to positive terminal of the vehicle's battery. No LED light = no voltage is present at the test point. Inject (supply) Positive power in to most circuits in order to check the circuit continuity and/or it's attached device/s operation. Place the Switch (7) in "Inject Positive" mode - forward position marked with 'I'. At this point the Test Tip of the probe will be energized with positive voltage and the Polarity Indicator will turn Red. Connect the Test Tip (1) to the point of interest to inject positive voltage directly from the battery positive terminal in to the device or circuit you're testing. Make sure the Test Tip makes good connection with the wire or device pin or terminal you are energizing. Take care not to touch the test tip directly to earth/ground/negative supply lines or body. Inject (supply) Negative power in to most circuits in order to check the circuit continuity and it's attached device/s operation. Place the Switch (7) in "Inject Negative" mode - backward position marked with 'II'. At this point the Test Tip of the probe will be energized with negative voltage and the Polarity Indicator will turn Green. Connect the Test Tip (1) to the point of interest to inject negative voltage directly from the battery negative terminal in to the device or circuit you're testing. Make sure the Test Tip makes good connection with the wire or device pin or terminal you are energizing. Take care not to touch the test tip directly to battery positive supply lines. The extra Earth Link with the small black crocodile clip can be used to provide negative supply close to the Test Tip area. It is connected directly to the battery negative terminal. 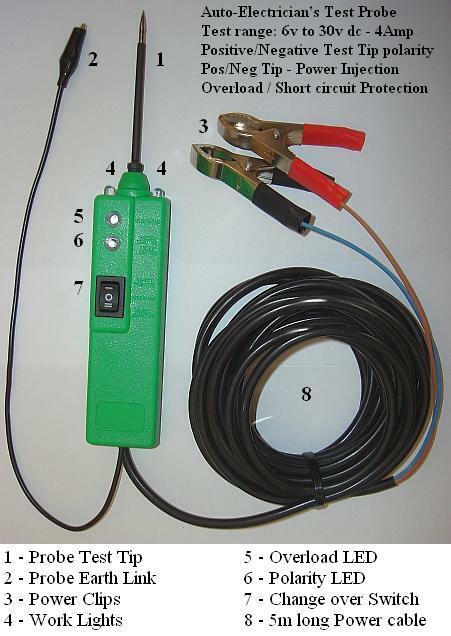 This extra earth link can be useful when testing devices which are disconnected from the vehicle system. To test an disconnected fuel pump use the negative link and inject-positive as above. The Power Test Probe is internally electronically protected against overload conditions due to short circuits or reverse current. When the Power Probe overload protection activates the Overload LED (5) will illuminate Yellow. The probe can remain in this condition indefinitely without sustaining damage. To continue normal operation remove the cause of overload/short etc. etc. When the overload or short circuit is removed, the probe will automatically recover and after a short time be ready for work. Maximum continuous current is 4Amp. Exceeding this will overload and trip the probe. Trip current is 8Amp maximum. When injecting power, do not use the probe's Switch (7) to interrupt current flow as arching over the switch contacts can occur. Physically remove the Tip from the load before returning the Switch (7) to "Measure" position - marked with '0'. Damage to electronic equipment can occur with improper use. Ensure that injecting power directly in to the system under test will not damage any electronic components. Most ECU's have negative outputs, thus injecting positive directly in to them will probably damage them. If you are unsure what you are testing a safer method is to use a small 5W globe connected inline between the Tip and the device you're injecting power to. 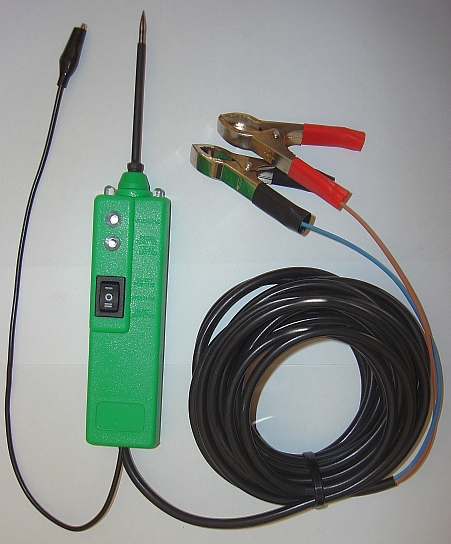 Do Not use the Probe to test or inject power in to High Voltage systems! This includes all Primary and Secondary Ignition circuits, HT Leads etc. etc. Failure to do so will damage the probe in an unique way and any warrantee will be voided. Do Not use the Probe on any system that the probe was not designed to operate including 220v AC or any system with power voltage over 36 volt DC. Our company will not be held responsible for any damage arising from the use of the probe. If in doubt, please read the legal terms and conditions of sale for all of our equipment.